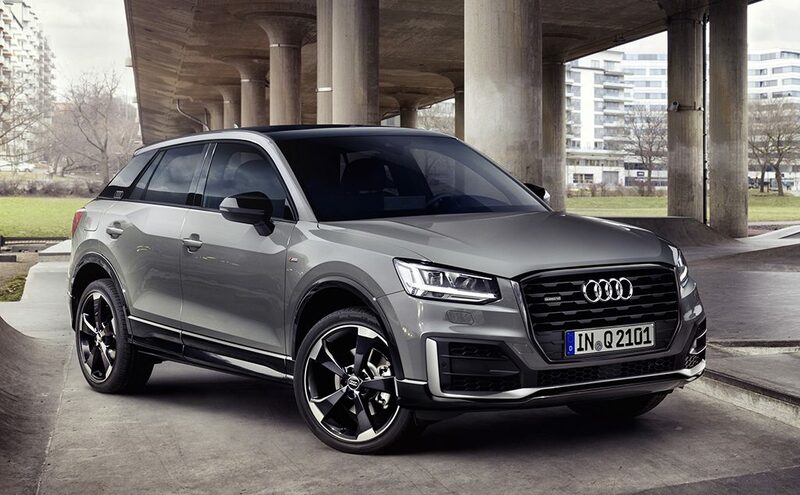 Seems everyone is crossover crazy these days, and Audi is the latest to enter the compact class, It’s a small crossover serving as the entry-level SUV in the company’s ever-expanding Q line-up. Unveiled at last year’s Geneva Motor Show, The Q2 may be the smallest and cheapest Audi SUV you can buy, but it’s certainly not the least interesting. It stands out against its larger Q3, Q5 and Q7 siblings thanks to some unique design traits. Audi is pitching it to younger buyers and there are plenty of customisation options, such as vibrant paint colours and trim inserts to make the cheapest Audi crossover more appealing. It’s still a premium-edged car, though, and a posher alternative to the likes of the offering s from Nissan, Toyota, Renault etc. 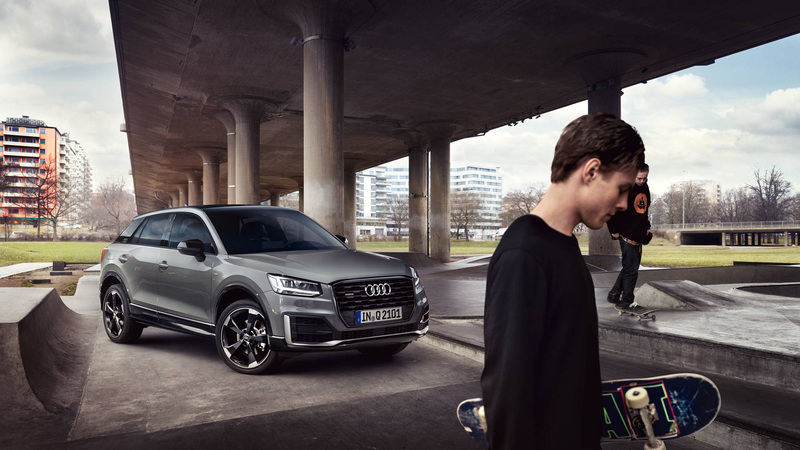 Aimed squarely at a younger audience, the Q2 stands out in Audi’s range, with bolder, sharper lines and a different shape to the company’s other SUVs. The small frame has been made to look as hunched and sporty as possible, with a high shoulder line in tandem with a roof that slopes down towards the rear, pinching the back end. Placed onto this are several new lines and design cues, such as the cut-out running down the top of the doors, the squarer, wider-looking profile around the back and a slightly different face. Rugged-looking cladding and skid plates also make the cut and they can be colour coded with the car’s body. There are also those huge, thick C-pillars towards the rear. 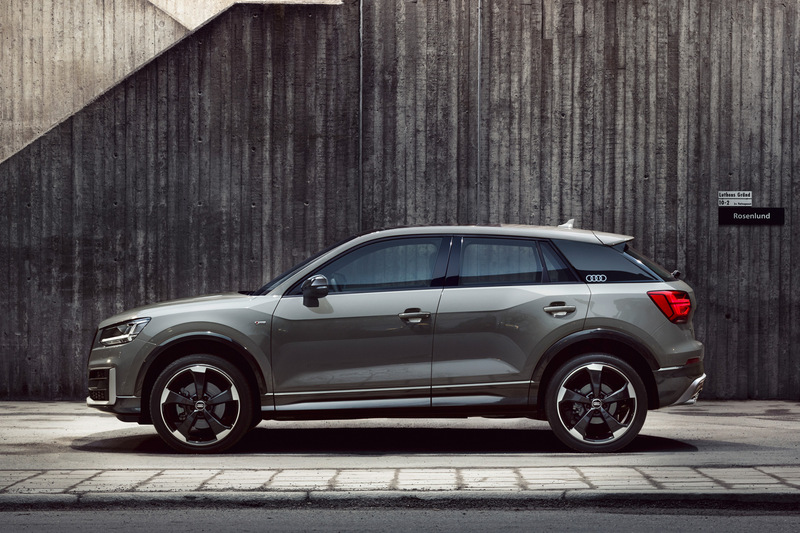 Audi calls them “blades” and, like many aspects of the Q2, they can be customised. Other options include 12 exterior colours a choice of alloy wheels, ranging from 16ins to 19ins, and a two-tone contrasting roof. 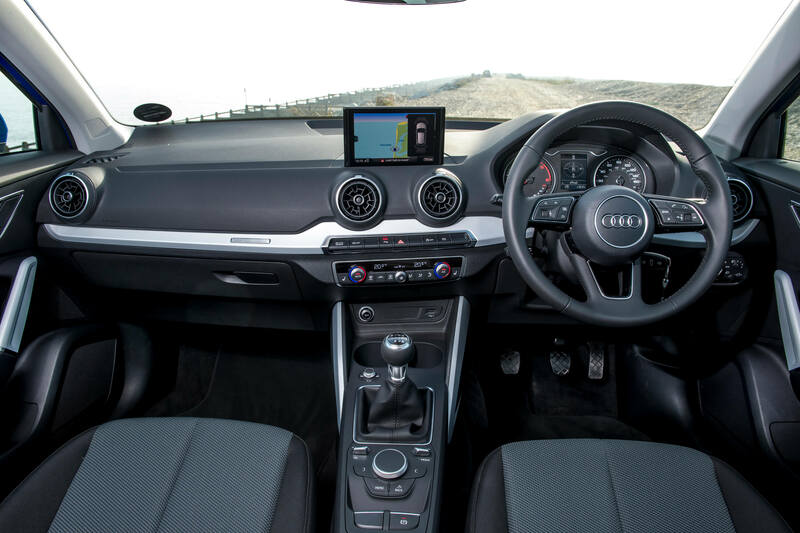 The interior is similar to the Audi A3, making use of the horizontal design theme that runs across many of the marque’s newer models. The Q2’s cabin has the potential to be much more vibrant, though, with buyers having a choice of colourful materials and metals. The materials are high quality: soft-to-the-touch plastics, leathers on some cars and brushed aluminium trim elements ready to spec, all crafted into a smart-looking package. As standard, drivers get a seven-inch infotainment screen on top of the dashboard. It’s operated through a rotary dial and buttons placed near the gear lever. The screen is used as an interface for the car’s settings, radio, and Apple CarPlay/Android Auto through Bluetooth or USB. Optional extras include a Bang & Olufsen sound system at an extra R9800, but one of the best additions to pluck for is Audi’s Virtual Cockpit – a large, second infotainment screen, measuring 12.3ins and replacing the manual instruments behind the steering wheel. It’s controlled via buttons on the steering wheel. Passenger space in the rear is good. Overall the Q2 is 11.93 cm shorter than the A3 hatchback, but there’s decent space and headroom for two adult passengers in the back. Boot space comes in at 405 litres and 50 more than you’ll find in the A3 hatchback and for instance the Nissan Juke, although it trails the Mini Countryman by the same capacity. The rear pew folds flat, however, to increase carrying capacity to 1,050 litres. With its wide opening doors and high roof line, the Q2 is more comfortable and spacious than Nissan Juke and Renault Captur. Tall people sitting in the back will find their knees brushing the front seats, however, but long journeys shouldn’t be a problem. There’s also plenty of storage bins around the cabin. The cubby holes in the doors are reasonably sized, as is the glove box, and there’s a little slot in the centre console for the key. The site adds that the driving position is comfortable, with plenty of adjust-ability. 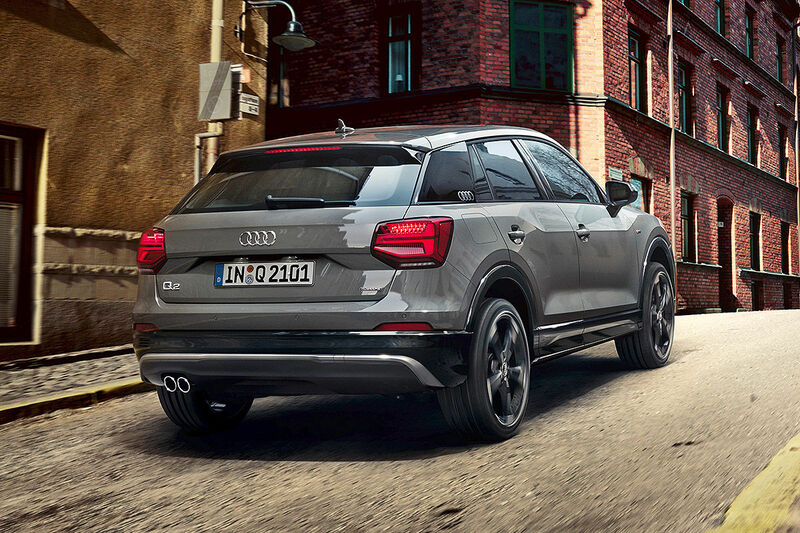 If you configure your Q2 now, the only diesel option is a 2.0-litre diesel with 105 kW. An S-Tronic automatic gearbox will be standard on this engine. Options are a 1.4-litre with 110 kW and options of 6 speed manual gearbox or S-Tronic automatic gearbox and a 1.0-litre three cylinder turbo with 85 kW also with a choice of 6 speed manual gearbox and S-Tronic automatic gearbox. As for the 1.4-litre TFSI petrol, it makes use of cylinder deactivation technology shutting down two of the engine’s cylinders when the engine is under-stressed and they aren’t needed as a way of saving fuel. This engine comes in Audi’s smallest hatchback, the A1, and it delivers a claimed 5.2 l/100km. The entry level Q2s will come in Standard and Sport trim, with 17ins alloy wheels as standard, as well as body colour ice silver blade C-pillars, a seven-inch infotainment screen. Those bumping their orders up to Q2 Sport trim will get 17ins wheels as standard, as well as sports seats and body colour or ice-silver detailing on their blade panel.